The whole center of Aalborg, which is a city with appx. 225.000 citizens, is the whole week focusing on sustainability. 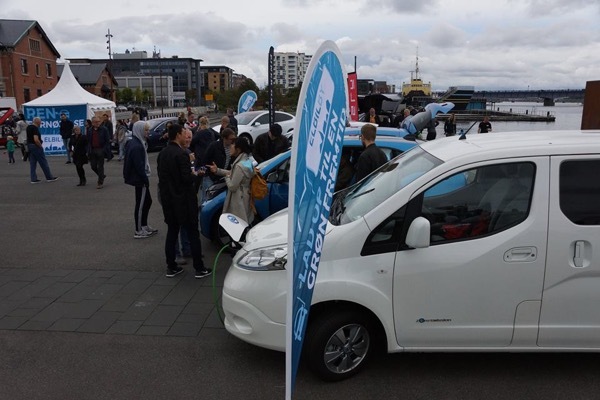 Food, clothes, energy and off cource transportation - our contribution we named "Electric cars for all", and we had a large area of ​​750 square meters available on the waterfront for electric cars, electric mopeds, charging solutions and as a starting point for electric car test runs. From electric car dealers and importers we had borrowed 5 different electric cars for trial runs, in addition, both private and dealer electric cars were shown. For the sake of good service, we had been granted extraordinary permission to drive in the city center, which is normally reserved for buses. Therefore, we always had smaller groups of electric cars circulating between squares and seats, to get even further with the good electric car message. Aalborg is a university city, with many foreign students, so there were many nationalities that showed great interest in our cars. As part of the yearly sustainability festival in Aalborg, the organisation ElbilBy this year will have appx. 150 square meters available for EV exhibition including test drives and some temporal EV charging spots. We are joined by multiple partners like Tesla, RentAPlug and others. Even though the City center is closed for cars, we got permission to have some EV cars circling in the center with 20-30 minute stops at central places to share EV knowledge and to show how silent and clean traffic can be. This festival in Aalborg continues for a week, and ElbilBy is on Thursday September 14 hosting a public conference regarding sustainability and traffic. ElbilBy is a group of Danish EV enthusiasts, who all work for free, fighting EV myths and answering almost any EV question based on own experiences. Click the button at the top of this page to register and you'll be entered to win a chance at a $250* US gift card. Registered attendees report 5,000 electric miles driven.